Until a few days ago, if you had asked me about the history of the Pisco Sour, I would have told you that the Pisco Sour was invented by Victor Morris at his bar in Lima during the 1920’s. And though Chile also claims to have invented the Pisco Sour, documents such as printed advertisements or his bar’s register show that Pisco Sours were being served at the Morris Bar before anywhere else. But a recent discovery of a Peruvian cookbook from 1903 made me question everything I thought I knew about the origin of the Pisco Sour. 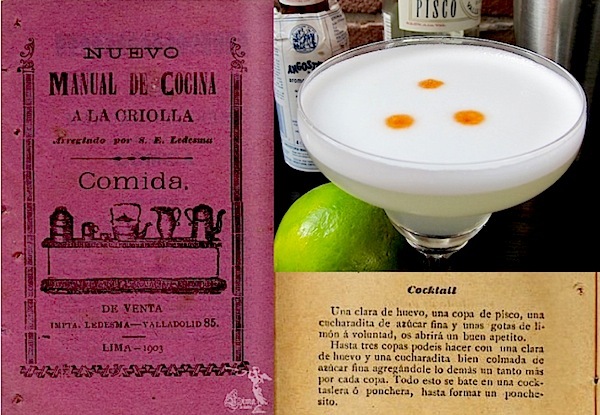 This cookbook, Nuevo Manual de Cocina a la Criolla (Lima 1903), suggests that the origin of the Pisco Sour may be a traditional creole cocktail made in Lima over 100 years ago. An egg white, a glass of Pisco, a teaspoon of fine sugar, and a few drops of lime as desired, this will open your appetite. Up to three glasses can be made with one egg white and a heaping teaspoon of fine sugar, adding the rest of the ingredients as needed for each glass. All this is beaten in a cocktail shaker until you’ve made a small punch. Doesn’t that sound like the Pisco Sour? Absolutely. It has all the ingredients with the exception of the Angostura bitters and perhaps ice. Also, it uses fine sugar instead of simple syrup. And, in the style of the book, it has no specific measurements, rather it’s made to-taste. Despite the obvious similarities it’s interesting that this cocktail is not yet called the Pisco Sour. But what makes this cocktail recipe really significant, is that it was published in 1903 — at least some 17 years before Victor Morris started making the famous drink at his bar in Lima. So if this recipe was published in 1903, isn’t it likely that the cocktail was being made in Lima even earlier? So what then is the origin of the Pisco Sour? 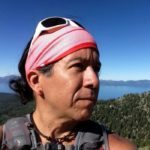 Is Victor Morris still the inventor? Without any more documents, it’s very difficult to answer those questions, but all we can say with certainty is that this Peruvian cookbook shows that a version of the Pisco Sour has been enjoyed in Lima for over 100 years. But to understand the origins of the Pisco Sour, we need to look at the history of more cocktails, such as the Whiskey Sour and Silver Sour. As Pisco historians have noted, it’s possible that the Pisco Sour was inspired by earlier cocktails such as the Whiskey Sour or the Silver Sour. For example, the first printed recipe for a Whiskey Sour appeared by 1887 in Jerry Thomas’ “A Bartenders Guide,” making it likely that Victor Morris was familiar with these cocktails from the Sour family. Perhaps Victor Morris also came across an early recipe for the Pisco Sour such as the one that appeared in the 1903 Peruvian cookbook, and using his knowledge of other Sour cocktails, experimented with measures until he came up with a version close to the one we make today. All that remained was adding bitters, ice, and a name to tie it to the Sour family. So now, if you ask me about the history of the Pisco Sour, I’ll have to mention this Peruvian cookbook from 1903 in addition to the mixology work done by Victor Morris, and the bartenders at the Maury Hotel and the Bar Ingles. Will we ever know where the first recipe for the Pisco Sour came from? Maybe not. But for now, we know it’s birthplace is still Peru.